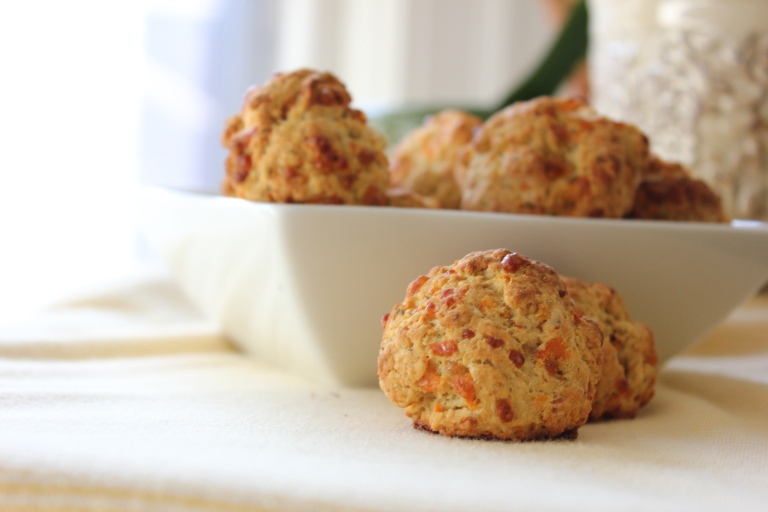 Mini Cheddar Carrot Biscuits — Blushing Wellness Co.
It’s time to get your holiday recipe lineup together, and these bad boys should absolutely be on the top of your list. Gluten-free, bite-sized, and veggie-filled! A winning combination that will leave EVERYONE at your table satisfied! Dissolve yeast into warm water for at least 10 minutes. In the meantime, grate and measure (using a kitchen scale) the cheese and carrots. Also using the kitchen scale, measuring and separate the gluten-free flour. Add a teaspoon of xanthan gum and a teaspoon of baking soda to both the 2.5 oz and 3 oz flour amounts. In a medium bowl, add the 2.5 oz gluten-free flour mixture, carrots, oregano, and yeast. Mix well. Place a damp cloth over the bowl and allow the dough to rise for about a half an hour, or until the dough has doubled in size. Add the 3 oz flour mixture, cheese, oil, sugar, salt, basil, garlic, and cayenne to the dough. Mix/kneed well. Let dough rise again for another half hour. Take a parchment-lined baking sheet, and place heaping tablespoons of dough on sheet. Place in oven for 15-18 minutes. Let cool for half hour and enjoy!